89plus is the latest attempt of the art conoscenti to grab a hold, make avant garde and create relevance in a world and a time that refuses all of the above. The project’s focus is on artists born after 1989. It promises to be a research platform and long-term project data mining the works and progress of artists from this new generation. It was co-founded by Hans Ulrich Obrist (age 45) and Simon Castets (age 29). The 89plus project was announced last year, and over the year they have had numerous workshops, salons and panel discussions hosted by Art Basel, DLD and others. The project will make it’s official institutional debut at London’s Serpentine Gallery in January 2014, it’s theme marking next year’s Marathon series. Obrist is the director of the Serpentine Gallery. Also important to note that the official sponsors of this project are DLD [Digital-Life-Design (age 7) a corporate platform that describes itself as a “global network on innovation”] and the LUMA foundation [a nonprofit (age 9) named after a billionaire heiress’s Maja Hoffmann’s (age 56) children, the billionaire heiress is a major collector, museum trustee, philanthropist and enabler of important art projects]. 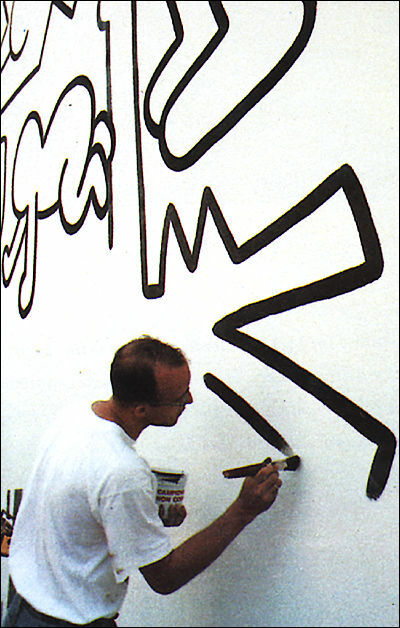 Keith Haring painting mural in Pisa, Italy in 1989, image courtesy the Haring Foundation. Getting back to the premise of this 89plus project: age. It’s an ageist premise, not surprising as the youth of all generations takes center stage as a potential answer to our future. Castets and Obrist refer to this 89plus generation as the “diamond generation”, which they explain is a term coined by Douglas Coupland (age 51), the Canadian novelist famous for coining the term “Generation X” in a previous novel of his (though he sites Billy Idol as the source of this term). My current feeling about the future is how it looks a lot like right now except the food’s better and they’ve already got whatever it is that replaces the internet. – Douglas Coupland in Guardian interview last weekend about his latest book. OK, I’m a little jealous that while my generation was defined by corporations and media as “X or Y or millennial”, these cats get the label “diamond”. Pretty special. Diamonds come from magma erupting under the earth’s surface. The Internet erupted in 1989, political frameworks erupted as well. Diamonds represent clarity and without a doubt the older generation of curators, dealers, and museums are constantly looking for this clarity to pierce the fog that is our times, and help them strategize for the future. What are these artists doing of consequence? Diamonds may also connote slavery, bloodbath, sweat, money, greed, extreme poverty or excessive wealth. While I appreciate the analogy of a diamond for a generation, I can’t say I value the defining of a generation of artists by their birth dates and within the context of a corporate-feeling platform. If you read anything on the 89plus web site, it sounds like it was most definitely written by someone born before 1989, and has a PR-specific tone to it. There is even a link to a “89Clubhouse” – the text on this page continues to make me dizzy and reminds me of the days when I was researching publicly-traded companies and pouring over their 10Qs. The 89plus project feels like a giant conglomerate that wants to please it’s founders, funders, under-served young artists and perhaps a future collecting public. That’s a lot to swallow as your mission. The corporate vibe was not lost on the tone of the web site. During a discussion sponsored by Art Basel Hong Kong, Obrist spoke of the intention of the project to make “poetry an industry”, citing the industrialization of mediums such as painting, they feel a need to have poetry “industrialized”. Why? Poetry remains a completely unique and special source for people to get inspired and to inspire – why industrialize this? What does that mean? The open platform of the 89plus project is compelling, anyone born after 1989 may participate. The co-founders promise not to ruffle their nascent creativity by launching exhibits, instead they will be coddled and researched through dialog and conferences. No need to put a stake in what you are trying to say in your work, simply be. Simply absorb. Simply reflect – like a diamond. In 2009 there was an exhibit at the New Museum in New York called “Younger Than Jesus“. The curatorial premise was to exhibit artists under the age of 33. Provocative, sure. Adding to a sincere dialog of the current discourse in art, not sure. In general using something like dates or ages is an easy way to frame and quantify something. There is truth in numbers, just visit Gapminder’s Lab and you will see the amazing and artful visualization of demographic, agricultural and scientific data. I’m sure they will have similar data visuals for the 89plus folks down the road. An interesting project for a statistician and visually compelling for anyone really. But is art science? No. Is art measurable? No. Whenever one tries to speak about art you realize there is a fiction to it – how can you speak about something that comes very close to that which unifies us all? But if you are influenced and inspired by market forces than yes, art may be quantifiable on your terms, not in the universal way in which it must exist. While it would be nice to think that each generation has a unique vibe – it’s own special snowflake – I truly believe we are always and every time humans. The only changes to generations is how we work, how industry changes and therefore effects our lives. Politics and industry give our bearing points to how we live and work as artists and otherwise. These 89plus generation artists will build and grow their practices within this highly elite, highly financed platform. The most interesting part of this project will be to see how it is broken. Aren’t diamonds used for cutting? Any artists “younger than Rihanna” should keep eyes peeled for generous grants such as this one being offered in conjunction with Serpentine and 89plus to help artists realize projects.